Recently, the name of the game for developers has switched from downloads to engagement, as Android Market and Apple’s App Store tweaked their ranking rules and Apple in particular started cracking down on incentivized install campaigns. The takeaway for developers is that they need to build more quality into their apps and find more ways to engage users beyond the initial download. That has increased the importance of mobile push notifications, which are poised to become even more vital tools for developers as they look to retain and engage users. Many developers already employ notifications to send out alerts, offers and remind users of updates. But now, the messages are taking on even more significance, because developers are being judged more on how often users are coming back to their apps. Android Market (s goog) and Apple’s App Store (s aapl) both altered their app store ranking formula recently, apparently rewarding apps that have better regular use by users. Apple has also started rejecting apps that use cost-per-install ad campaigns, which was apparently targeted for manipulating the download numbers of apps that used it to gain users. Now with fewer tools to drive downloads, it becomes even more important to hold on to the users they have. Even before the app store changes, retention was already an issue for mobile developers. A study last year by Localytics found 26 percent of apps were only opened once. If you factor apps that were opened less than four times, the rate is 55 percent. But if you can get users to agree to notifications for things they care about, it can keep people coming back. Dictionary.com, for example, started pushing out notifications for its Word of the Day earlier this year and saw active usage grow by 6 percent. That’s why it’s becoming critical to keep users involved in the app, because even a modest increase in usage means saving an app from abandonment and potentially making more money through advertising and in-app purchase. One obvious way is to just build a really good app. But with all the software on people’s phones — 48 apps on the average iPhone and 35 on Android devices — it’s still a challenge to get people to come back. Notifications, when used well, can keep a conversation going between an app maker and their customers. As Fred Wilson of Union Square Ventures noted recently, if you have good notifications, it keeps users involved in more apps, even if the programs are buried on hidden screens or files. Notification inboxes can almost become the new home screen for users, who don’t have to delve into apps as often. There are still a lot of pitfalls for utilizing notifications. If users aren’t prepared for the flow of messages, the notifications can quickly become seen as spam. At that point, consumers will either delete the app or turn off the notifications, which ends the chance to keep talking to that consumer. Kveton put together a white paper on the best practices of notifications recently, noting that developers need to get users to opt-in with a clear value proposition about why they’re being asked to receive them. Users need to be given ways to configure their notifications. And most importantly, developers need to figure out the best way to reach their users, which can be an art. Jonathan George, CEO of Boxcar, a notification platform, said it’s all about understanding the threshold of users, and learning to stay within their limits. He said the majority of iOS users only get one message every three days. But it’s important to be mindful of what is too much and when is the best time. Apps that push out notifications at the same time every day might be missing out on opportunities to hit users when the message may be more relevant to what they’re doing. When it’s done right, with user consent and notifications that have value, it can strengthen the relationship between users and the app, he said. 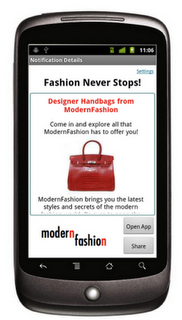 George said notifications are becoming a major marketing channel that can surpass SMS text messages. He said 25-30 percent of the time, users open notifications within the first 30 seconds, about twice as high as SMS messages. And it’s easier to measure the effectiveness of notifications because they can use rich analytics. Notifications can also be built with rich media, allowing for more appealing and effective messages. 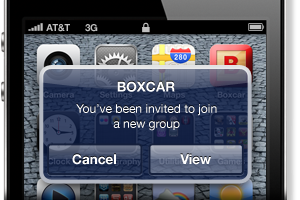 The growing popularity is opening up opportunities for Urban Airship, Boxcar and Xtify, another push notification service. Kveton said since launching in June 2009, Urban Airship is being used in 13,000 apps and has delivered 3 billion notifications, including almost 1 billion in the last quarter. 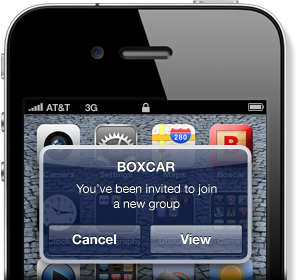 Boxcar has built a notification inbox service developers can plug into, allowing users who download Boxcar to get notifications from multiple apps through a single manageable inbox. It’s an idea that works well especially on iOS, with its simple and sometimes annoying notification system. But it will likely be something we’ll see more fully fleshed out on all platforms as notifications grow in popularity. Even with the growth of notification services, there are still a lot of apps that don’t use push notifications, something these companies are looking to correct. Xtify recently put out a new plug-and-play tool called Xtify Retain, a free self-service notification platform that allows developers to easily set notifications based on pre-configured times or after certain periods, such as a number of days after the app has been opened or last used. Josh Rochlin, CEO of Xtify said it’s all about helping developers keep customers, rather having to spend more money to get new ones. Already, 2,000 developers have downloaded the Retain SDK. Rochlin said Xtify made the Retain tool free and is looking to make money off of premium services around location-based notifications and analytics. Disclosure: Urban Airship is backed by True Ventures, a venture capital firm that is an investor in the parent company of this blog, Giga Omni Media. Om Malik, founder of Giga Omni Media, is also a venture partner at True.